The Hasbro Furchester Hotel Playset with Figures is the perfect gift for fans of this Muppets spin-off TV show. By featuring a clever folding suitcase style design, kids can easily pack it up safely and take it to a friends’ house without losing any of the pieces. This set includes hotel areas seen in the show such as the hallway lobby, dining room and kitchen as well as the lift to take guests up to the first floor. Figures of Elmo and Phoebe are included in the set plus a number of accessories such as table, chairs and a luggage trolley. This playset is suitable for kids as young as 18 months old. 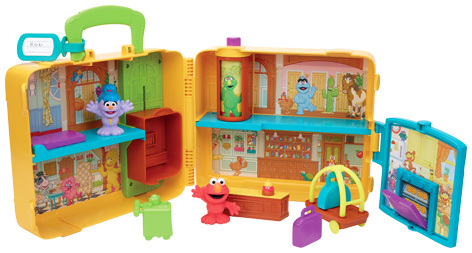 It packs in lots of play value into a small space, and is just one of a number of Furchester Hotel toys by Hasbro. Other products include plastic figurines of all the main characters, soft toys in several versions and sizes as well as games and puzzles. Please tell us what you think of The Furchester Hotel Playset by Furchester Hotel and Hasbro.